A community college in Columbus, Columbus State (CSCC) offers two-year career programs in more than 50 areas of business, health, public service, human service, engineering technologies, and facility maintenance as well as transfer programs for students who are interested in completing the first two years of a bachelor's degree, then transferring to a four-year university. Degree program offerings are very diverse, including fields such as Nursing, Architecture, Geographic Information Systems, and Nuclear Medicine Technology. Columbus State also offers Automotive Technology, Applied Technology, Aviation Technology, Real Estate, Law Enforcement, Paralegal Studies, Fire Science, Sport & Exercise Studies (three majors: Sport Management, Physical Education and Exercise Science), Massage Therapy, Veterinary Technology, and Respiratory Care. 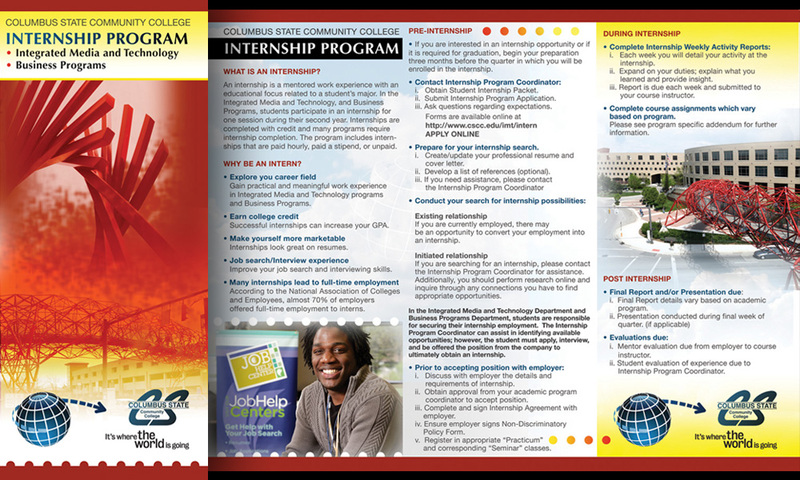 Design a brochures: one that would be distributed to the business community, and one to be handed out to students, promoting the Columbus State Student Internship Program.